Are you looking forward to the winter season? When you were young, the arrival of the winter months meant holidays, time off school, and building snowmen. Not anymore! Now this time of year means staying warm, dealing with heavy traffic, and worrying about your furnace. Take one worry off your mind this year. How can you do it? Make sure you get your furnace ready for the months ahead. Some of this can be done by yourself and some of it requires the help of a professional heating contractor. Don’t put it off any longer. For a furnace that runs effectively all season long, these are some of the most important things you need to do. Let’s start with what you can do on your own. The first and most important thing is changing your furnace filter. This should be done every 1-3 months depending on the type of filters you are using and your home environment. To keep your furnace working well, perform an inspection of your filter every month or so. This will give you the chance to see whether it needs to be changed or if it is free from contaminants. You can tell if the filter needs to be changed by the grey colour and any visible build up of dust and dirt. A helpful pre-winter tip? Sometimes you can get a better deal on filters if you buy them before the weather gets too cold. So, stock up if you get the chance. Something else you can – and should – do on your own? Clear the area around your furnace. You don’t want to store any items too close to the unit. Not only does this make it harder for the heating contractor to get a good look at your furnace but it also poses a threat to your overall safety. Speaking of heating contractors, your next step is to give one of them a call. Ideally, this should be done before the winter weather arrives. Wondering why you can’t wait a little longer? You never want to turn on your furnace on a cold day to find that it doesn’t work. That can cause you to be left feeling the chill. Schedule a visit as soon as possible. You want to choose a heating and cooling company that can trust, like Heating Ontario. During the visit, you can expect one of our heating contractors to inspect your unit thoroughly. They will check that the furnace is ready for use. That means looking into both the safety and efficiency of your unit. This will reduce the risk of your furnace failing during the winter months. That in turn means an emergency repair is less likely in your future. In addition to inspecting your furnace, our heating contractor may change the filter if you haven’t already, check for leaks, and make sure that every part of your furnace is ready to go. If there is a problem, you can trust us to find the best possible solution. Don’t let winter worries affect your life. 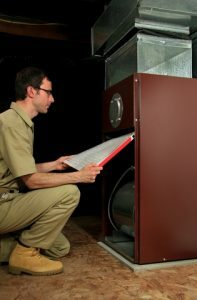 Take a pro-active step by scheduling your annual furnace maintenance now. With the help of a Heating Ontario professional, your furnace will be winter ready in no time. Let us keep your home warm and toasty this season!